We’d love your help. Let us know what’s wrong with this preview of Beach House for Rent by Mary Alice Monroe. When Cara Rutledge rents out her quaint beach house on Isle of Palms to Heather Wyatt for the entire summer, it’s a win-win by any standard: Cara’s generating income necessary to keep husban New York Times bestselling author Mary Alice Monroe returns to her beloved Isle of Palms to tell the poignant, charming story of two women, one summer, and one very special beach house. To ask other readers questions about Beach House for Rent, please sign up. The Beach House by Mary Alice Monroe is a 2017 Gallery Books publication. I’ve been dying to sink my teeth into this latest installment in the ‘Beach House’ series by Mary Alice Monroe! I’ve never been disappointed by one of MAM’s novels, but this one is especially poignant and is simply storytelling at its finest. Once again, we return to the magical beach house filled with special memories of Lovie, Cara’s mother, who stubbornly refused to sell it, eventually handing it down to her daughter. O The Beach House by Mary Alice Monroe is a 2017 Gallery Books publication. Once again, we return to the magical beach house filled with special memories of Lovie, Cara’s mother, who stubbornly refused to sell it, eventually handing it down to her daughter. Over the years, Cara’s often overbearing and obnoxious brother, Palmer, has pushed her to sell the prime location, but Cara has firmly refused him. However, dark and ominous financial clouds are gathering over Cara and her husband, Brett, which makes selling the house very tempting, indeed. Heather has been commissioned to do bird sketches to be used as models for United States postage stamps!! While she is very excited about this honor, her extreme social anxiety, and panic disorder keep her from living life to its fullest. To top it off, her father recently remarried- to a much younger woman, who does not want Heather living at home any longer. So, her father gently nudges Heather out of the nest by renting her Cara’s beach house for the summer. This will give Heather time to work with her birds, get her job done, and maybe learn to live on her own- at least for the summer. But, when a horrific and cruel twist of fate occurs, Cara finds she really needs to recover in the peace and comfort she can only find at the beach house. However, with Heather living in the house for the summer, Cara must make a compromise that will suit them both, which soon becomes the foundation for a very special bond between these two unlikely friends. I always find myself totally wrapped up in the drama, love, laughter, and friendship exhibited in this series. The characters are so real, they feel like people you would meet anywhere, or that you might know personally, which makes their stories feel so real, raw, and emotional. I really took to Heather right away, understanding what it is like to live with a disorder few people understand, and are so quick to make judgements about. The more I learned about her, the more I liked her. She made so much progress, and Bo was a big part of her journey. But, what really sold me on her character was the way she took Cara in her arms and became a rock for her, even though Cara wasn’t having any of it in the beginning. But, Cara’s story is the one that was the hardest to go through emotionally. Her fiftieth birthday has her taking stock of her life and her future, as she realizes that something is missing, something that has her feeling restless, and keeps her from feeling completely content. She’s been struggling to help Brett keep his business afloat, living out his dreams and passions while hers have all but disappeared. I think many people wake up at some point and realize that life’s twists and turns took them onto paths they weren’t expecting. While they may have found more happiness because of those surprising developments, it may also mean one's dreams were placed on hold or never realized. For Cara her hopes for motherhood were dashed,and she had also left her high- powered career behind to make a life with Brett, so she ended up working at a ‘job’ helping to make ends meet, but did not find it all that fulfilling. So, in part, Cara’s story is about her journey toward the discovery of her one true passion, even at this stage in her life. We all need something we are passionate about to keep us focused and centered no matter what other ups and downs, triumphs and failures, life throws onto our path. Of course, the story is also one of friendship and loyalty, about helping people through difficult periods, and coming together in times of need. This is a wonderful, heartwarming story, and it had the same effect on me as comfort food might, or chicken soup for the soul or something. I absolutely need these types of stories to lose myself in, to take me away from the world’s hardness for a while. No matter what, I always feel better after reading one of MAM’s novels. One more thought, before I finish- I can’t write a review about this series, without mentioning the ecology and animals the author weaves into her stories, which educates, but also serves as a reminder, that we are responsible for the well being of birds, and all beach life and aquatic creatures, no matter how superior you may feel, or how entitled you may feel about using the beach for your own enjoyment. As always, I came away from this story feeling humbled and deeply satisfied. Another outstanding job by this author! I do hope, like Cara promised, she will be back soon! 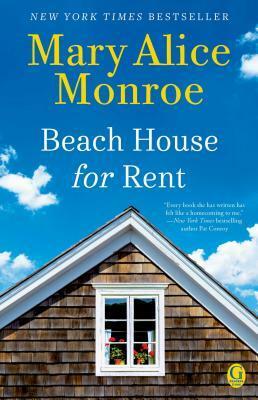 “Beach House for Rent” is the newest novel from Mary Alice Monroe. I have to admit I have not read all her books. This book is 4th in a series, but I didn’t feel like I missed out on anything having not read the first two books. I hate to sound like a broken record, but I found that I laughed and cried in equal measure as I was reading. Her character development was flawless, the story so intriguing and the writing was delightful. I do not live near the ocean, but I felt the sea air a time or tw “Beach House for Rent” is the newest novel from Mary Alice Monroe. I have to admit I have not read all her books. This book is 4th in a series, but I didn’t feel like I missed out on anything having not read the first two books. I hate to sound like a broken record, but I found that I laughed and cried in equal measure as I was reading. Her character development was flawless, the story so intriguing and the writing was delightful. I do not live near the ocean, but I felt the sea air a time or two during my reading. Oh, and the canaries were such a great touch and truly gave Heather more development even from the beginning. I‘m not a believer in retelling the story so let me say one thing. If you love heartwarming stories, read this book. You’ll get a lot of detail about the islands, the birds, the people and the turtles. It will make you wish you lived there, particularly if you live in the Midwest! I’m ready to pack my bags! Beach House for Rent is #4 in Mary Alice Monroe's Beach House series. I hadn't read the previous books so I can say this is a very good stand alone, and I am sure lovers of the series would also relish this beautiful addition to it. Cara is just turning fifty and she is having a life crisis. While happily married to Brett for the last ten years, she feels she is missing out on something, a passion and purpose in life over and beyond what she has now. Once a very successful advertis Beach House for Rent is #4 in Mary Alice Monroe's Beach House series. I hadn't read the previous books so I can say this is a very good stand alone, and I am sure lovers of the series would also relish this beautiful addition to it. Cara is just turning fifty and she is having a life crisis. While happily married to Brett for the last ten years, she feels she is missing out on something, a passion and purpose in life over and beyond what she has now. Once a very successful advertising agent she is now questioning where her life is going. As the story unfolds and as it turns out her whole life is turned upside down in this book and it is a slow crawl out of the deep hole she finds herself in. Heather is a young woman who lost her mother in a car accident that Heather too was in. Always a shy person she now suffers from panic attacks and social anxiety. However what she does have is a passion for painting and she has just won a commission to paint some southern seabirds for some stamps. When her father arranges for her to spend the summer in the beach house she is really anxious about it - however it turns out to be a very healing and growing time for her. If you love the beach and the sea and the sand and the romance of a beach house then you can indulge in this book - it is alive with the sights and sounds and beauty painted in words for you to envision by Mary Alice Monroe. The beach house - Primrose Cottage is delightful, who wouldn't want to spend a summer in it, no one in their right mind would sell it. As in all the novels I have read by Mary Alice Monroe the flora and fauna of the southern coast of Carolina is wonderfully brought to life. Through Heather's eyes we see the wonders of the birds and the turtles. We also get a peek into the life of canaries as Heather as three gorgeous birds that bring her so much joy. And of course there is a strong theme of environmental care running through the story. Cara Rutledge rents the beach house inherited from her mother, Lovie, to Heather Wyatt for the summer. The income will help Cara and her husband Brett keep the ecotourism boat in business. The younger woman, Heather, who until this point has been has been living at home with her father and his recent new wife, is an artist. The aim is for her to work on a series of painting of shorebirds. These have been commissioned and will become the basis for postage stamps of birds. Along with Heather are h Cara Rutledge rents the beach house inherited from her mother, Lovie, to Heather Wyatt for the summer. The income will help Cara and her husband Brett keep the ecotourism boat in business. The younger woman, Heather, who until this point has been has been living at home with her father and his recent new wife, is an artist. The aim is for her to work on a series of painting of shorebirds. These have been commissioned and will become the basis for postage stamps of birds. Along with Heather are her three feathered canary friends. Heather is unprepared for the young man, Bo, who is working on the deck of the beach house. Almost fifty Cara, even though she is happy in her marriage to Brett, has been dealing with some discontent about her purpose in life. Tragedy arrives unexpectedly. Both these women of different generations find circumstances change for them in ways they never expected. Cara and Heather are good characters, and Bo is a sweetie. But there are other practical, down to earth, likable characters that inhabit this Isle of Palms. Some of the characters like Cara and her mother Lovie, Cara’s brother Palmer and others were familiar from earlier books in this series. Like catching up with old friends. I enjoyed other books in the series, but this is my favourite. Maybe because it’s holidays and I see tourists around as I live near the beach. Maybe it was just the sort of feel good read I needed at this time. It is a book about family, friendship, love, loss and changes in life. The canaries with their songs, reminded me of one my mother had and the way it use to melodiously whistle. The pelicans were a favourite. The first time I knew pelicans came in any other colour than white and black. And, of course given this setting and Cara’s history, there is a little about sea turtles as well. I have to thank the publishers and Netgalley for offering me an ARC of this book in exchange for my opinion. I loved this book. All of MAM's work touches me. More than a "beach read", her books are comforting, full of old friends, with just enough drama and grief to make us appreciate the joys of life. And, as always, she educates us. And here, we learn about anxiety, shorebirds, the environment, canaries, and, the great sea turtle. Truly a standalone story, but for readers of the Beach House se I have to thank the publishers and Netgalley for offering me an ARC of this book in exchange for my opinion. I loved this book. All of MAM's work touches me. More than a "beach read", her books are comforting, full of old friends, with just enough drama and grief to make us appreciate the joys of life. And, as always, she educates us. And here, we learn about anxiety, shorebirds, the environment, canaries, and, the great sea turtle. Truly a standalone story, but for readers of the Beach House series, a handful of the old crew is here, with Cara being the main character. Heather is new, and she was delightful. These 2 women each face tragedy and difficulties, become friends, and help each other get though and triumph. Family, friendship, love. The things that really matter in life. There's a reason Mary Alice Monroe is one of the South's most beloved storytellers. Another great read by a favorite author! Mary Alice Monroe is one of my favorite authors. While this installment is well worth a read, it is my least favorite in this series. The story line didn't hold my attention quite as well as the others. One thing for sure, Monroe captures the beauty of the SC coast and delivers perfectly. Just finished the latest from MAM...every time I think I can relax with a frothy summer read, she adds a story with unexpected depth. Really enjoyed this and liked that a few characters from a different series have cameos. Her portrayal of friendships makes you want to go hug your own, and makes you wish some of her characters were not fictional so you can hug them too. This is the 2nd book I’ve read by Mary Alice Monroe. This book was an easy, fast read and I really enjoyed it. Seems like all my books lately have been a thriller or a crime book so it was nice to read a “light read”. Loved it! Definitely a picturesque southern beach read (Lowcountry Isle of Palms), the story line really drew me in. This is a very touching book about a couple of women who are trying to find their path after experiencing great difficulties. The book was interesting, had some great characters, and a wonderful setting. Cara and Heather are both trying to find direction in their lives. Cara is recently widowed and Heather has been almost agoraphobic since her mother's death during Heather's senior year of high school. Both of these women need and find healing over the course of a summer in the beach house that b This is a very touching book about a couple of women who are trying to find their path after experiencing great difficulties. The book was interesting, had some great characters, and a wonderful setting. Cara and Heather are both trying to find direction in their lives. Cara is recently widowed and Heather has been almost agoraphobic since her mother's death during Heather's senior year of high school. Both of these women need and find healing over the course of a summer in the beach house that belonged to Cara's late mother. Cara has Heather and a few other dear friends to lean on, and Heather has Bo, who quickly becomes a guiding force in her life. I enjoyed this light read; the characters were likeable and the writing very good. Mary Alice Monroe is a fantastic author in this genre. As a side note, I will probably not be posting very much in the near future, as we are waiting to hear from the doctor about a very potentially serious health condition of my husband of 30 years. All prayers are appreciated! I do love Mary Alice Monroe. Her books set in the Low Country always makes me want to visit the Isle of Palms. This is book number four in the series. I have read everything so far, except for "Beach House Memories". This fourth book comes with major changes for the character of Cara Rutledge. Now 10 years after coming home to the Isle of Palms, she is happily married to Brett, but wishing that she had something passionate to be involved with. Doing the books for Brett's eco-tourism boat is okay I do love Mary Alice Monroe. Her books set in the Low Country always makes me want to visit the Isle of Palms. This is book number four in the series. I have read everything so far, except for "Beach House Memories". This fourth book comes with major changes for the character of Cara Rutledge. Now 10 years after coming home to the Isle of Palms, she is happily married to Brett, but wishing that she had something passionate to be involved with. Doing the books for Brett's eco-tourism boat is okay, but it's not enough for her. Readers know that Cara and Brett tried multiple times to have children, and after multiple miscarriages, came to the decision that they were not meant to have children. Cara and Brett rent out Cara's deceased mother's cottage every summer. Now this year, they need the money more than any other time due to Brett's business struggling. This brings us a new character, Heather who is being ushered out of her family home after her father's new marriage. Heather is going to evoke a lot of sympathy with readers. Still dealing with anxiety and PTSD after a car accident that left her mother dead, Heather is not good around people. Her father rents Cara's cottage in order to get her away from his new bride (near her age) and to allow Heather time to complete her commission by the U.S. Postal Service to pain shorebirds for new stamps. I have to say that Heather's profession was definitely a new one on me. Monroe goes back and forth between Cara and Heather. You get to see two strong women in different points in their lives. One of them is dealing with something so huge though that it had me tearing up in sympathy too. Make sure that you keep tissues nearby. What I did like is that both Cara and Heather are going through things that are making them wish for their mothers to be there to comfort them. Instead they eventually start up a friendship that I loved. I will complain though that I wanted more Flo and Ellie (Cara's long time friends and cheerleaders). I also think that Cara's brother Palmer is annoying. I did love how he stepped up for her in this one though. I wanted to see more of the other characters that we have been reading about for ages though like Toy and Little Lovie (see "Swimming Lessons"). The writing was like coming home again though. Being laid up I needed a comfort read. I had some books that were not doing a blessed thing for me that I sent back to the library. This one definitely hit the spot. The flow was good too. I just think that after a while I was more invested in Cara's story and Heather's story felt a bit too unfinished to me. I absolutely loved that my Kindle version showed pictures of the different birds. I just wish it had been in color. The ending surprised me, in a good way. Due to the changes in Cara's life, she decides a change is needed, and we have her trying something new. Immediately after finishing this, I went and bought "Beach House Reunion". Heather Wyatt’s life is turned upside down when her father rents her a beach house for the summer so he can spend time alone with his new wife. This is all new to Heather who suffers from anxiety attacks when she’s out of her normal environment. However, it’s the perfect place for her to paint birds for her postage stamp commission that she has been hired to do. So, Heather reluctantly agrees with her father’s plan. Cara Rutledge is happy to have rented her beach house for the summer as she can u Heather Wyatt’s life is turned upside down when her father rents her a beach house for the summer so he can spend time alone with his new wife. This is all new to Heather who suffers from anxiety attacks when she’s out of her normal environment. However, it’s the perfect place for her to paint birds for her postage stamp commission that she has been hired to do. So, Heather reluctantly agrees with her father’s plan. Cara Rutledge is happy to have rented her beach house for the summer as she can use the money. However, tragedy strikes and she desperately wants her house back. She has no intention of waiting for the summer to end. She wants and needs it now. Heather, who has fallen in love with the house, has no plans to leave until the agreed upon time. This is the fourth book in Mary Alice Monroe’s Beach House series. It’s the first one that I read and I didn’t feel as if I missed a thing. I do want to go back and read the first three books. I’m truly interested in learning the back story of the beach house and its occupants. The book doesn’t leave you hanging. It all wraps up nicely in the end. The storyline is poignant and touching. The characters aren’t perfect. They are realistic. They are people you can truly care about. I’ve never read a book by Mary Alice Monroe before, but this definitely will not be my last. I enjoyed her writing style, characters and story. I’m looking forward to reading the next book in the series. I feel as if I have just taken a trip to the beach and spent time with friends. Mary Alice Monroe creates such wonderful characters that you feel as if you know them and the South Carolina low Country is always an important part of her novels. Cara Rutledge is the daughter of Lovie from book 1 and she inherited Lovie's beach house. She and her husband, Brett, rent the house out for the summer and just got a rental for the entire summer from Heather a young woman from NC who suffers from extreme I feel as if I have just taken a trip to the beach and spent time with friends. Mary Alice Monroe creates such wonderful characters that you feel as if you know them and the South Carolina low Country is always an important part of her novels. Cara Rutledge is the daughter of Lovie from book 1 and she inherited Lovie's beach house. She and her husband, Brett, rent the house out for the summer and just got a rental for the entire summer from Heather a young woman from NC who suffers from extreme social anxiety and has come to the beach to paint shore birds. As Heather works to overcome her anxiety, Cara suffers a life changing tragedy and wants to return to her mother's house. Can two women from such different age groups and backgrounds share the same home happily? This is a wonderful story about friendship and love and healing from tragedy. Mary Alice Monroe is a dedicated conservationalist and her love of animals is very apparent in this book with sea turtles as well as pelicans. I always learn new things when I read her books while I am enjoying her novel and taking my mini mental vacation to the beach. Cara's mother left her a cottage, Primrose, on the Isle of Palms, South Carolina and even though it's quite old, she refuses to sell it (the land is worth a fortune! ), because it means so much to her. Cara and her husband rent out the house for the summer to an artist, Heather, who has the incredible task of painting shorebirds for postage stamps. Heather struggles with some major social anxieties and normally keeps to herself, but that is hard to do on the Isle of Palms. For starters, Bo Stanto Cara's mother left her a cottage, Primrose, on the Isle of Palms, South Carolina and even though it's quite old, she refuses to sell it (the land is worth a fortune! ), because it means so much to her. Cara and her husband rent out the house for the summer to an artist, Heather, who has the incredible task of painting shorebirds for postage stamps. Heather struggles with some major social anxieties and normally keeps to herself, but that is hard to do on the Isle of Palms. For starters, Bo Stanton is building a deck on the property and she sees him everyday. Despite her major social issues, she can't help but feel a connection with him and the same goes for Bo. He actually helps Heather move out of her comfort zone. Then there's Cara who deals with a major and unexpected tragedy that shatters her once perfect world into a million pieces. To recover from this major blow, she wants to find refuge at Primrose and ends up rooming with Heather. In turn, an unexpected friendship forms and both women help each other through life's ups and downs. 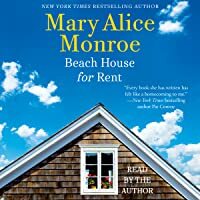 Mary Alice Monroe's Beach House for Rent is a perfect beach read for fans who enjoy Dorothea Benton Frank's novels as well as beach fiction about female friendships. What an enjoyable book. You have Heather, a super introvert who has panic attacks when dealing with anything. She has pretty much become a recluse. Her father rents the beach house for the summer so that Heather can work on her commission of painting beach birds as postage stamps. Then there is Cara, owner of the beach house. A tragedy sends her into a tailspin and she needs a place to live so she moves back to the beach house. The book covers what a family means and that doesn't mean blood rela What an enjoyable book. You have Heather, a super introvert who has panic attacks when dealing with anything. She has pretty much become a recluse. Her father rents the beach house for the summer so that Heather can work on her commission of painting beach birds as postage stamps. Then there is Cara, owner of the beach house. A tragedy sends her into a tailspin and she needs a place to live so she moves back to the beach house. The book covers what a family means and that doesn't mean blood relatives. It shows how you can grow and bloom and live again. This story will remind you not to take things for granted and to slow down, breathe and enjoy the moment. I love beach books and wish I had been on the beach reading it :-). I wasn't but that didn't keep from enjoying this easy read. There were some moments that I had a "gasp" moment of something I didn't expect. I like the little surprises and how she touched on a sensitive subject, anxiety. An enchanting beach story of two strong-willed women struggling to overcome emotional hardships while surrounded by good friends and the healing power of nature. Cara Rutledge loved the quaint yellow cottage perched on a dune overlooking the Atlantic Ocean. Primrose Cottage has weathered the storms and the sunshine on the Isle of Palms for eighty-five years. This isolated island is where Cara had learned to swim, fish and climb trees as she was growing up. This is where she met and marrie An enchanting beach story of two strong-willed women struggling to overcome emotional hardships while surrounded by good friends and the healing power of nature. Cara Rutledge loved the quaint yellow cottage perched on a dune overlooking the Atlantic Ocean. Primrose Cottage has weathered the storms and the sunshine on the Isle of Palms for eighty-five years. This isolated island is where Cara had learned to swim, fish and climb trees as she was growing up. This is where she met and married the love of her life. Primrose originally belonged to Cara's mother, who passed away and handed it down to Cara. Cara rented her beloved beach house to Heather Wyatt, 26, for the summer. Heather's anxiety has kept her indoors for years with her three pet canaries. Heather's summer at Isle of Palms is an exercise in living on her own, and completing an art commission painting shorebirds. Painting shorebirds requires her to go outside the confines of the beach house, an immense struggle for Heather. With help from new found friends Heather begins to flourish in this cozy cottage on the beach. After renting the beach house to Heather, Cara experiences an immense tragedy. She longs to go back to her sanctuary, Primrose Cottage, to recover. After an initial clash, Cara and Heather agree to live together for the remainder of the summer. The two women, despite age difference help each other through difficult times, and each are able to draw their strength from friendships, and from the beautiful nature that surrounds them. Two strong women, a comfortable yellow beach house, daily birdsong, good friends and romantic sunsets dinners, what could be better. Beach House for Rent was a most enjoyable read. The story was light, and it was a fabulous quick read. The characters were well developed and very likable. Mary Alice Monroe's writing is vivid and flawless. I loved how the birds and the beach were brought to life in this book. Reading about the long neck brown pelicans, the tall pink roseate spoonbills, and strong and graceful loggerhead turtles made me yearn to smell the salt air of the low country and feel the sand between my toes. Highly recommended for a summer beach or poolside read! Mary Alice Monroe is a New York Times best-selling fiction author known for richly textured books that explore the compelling parallels between nature and human nature. This is her fourth book in her Beach House series. Cara Rutledge is a 50 year old woman who is happily married to the love of her life, but she feels that something is missing. Once an advertising agent known for her take no prisoners attitude, she has settled way down in a small beach town in the Carolinas. When one event upturns her entire world she starts to question who she is and what her purpose in life is. Going home to her mother’s beach hous I received an ARC of this book from the publisher via Netgalley in exchange for an honest review. Cara Rutledge is a 50 year old woman who is happily married to the love of her life, but she feels that something is missing. Once an advertising agent known for her take no prisoners attitude, she has settled way down in a small beach town in the Carolinas. When one event upturns her entire world she starts to question who she is and what her purpose in life is. Going home to her mother’s beach house seems to be the only answer but it has a tenant for the rest of the summer. Heather Wyatt is in her early twenties but not without issues of her own. After a horrible car accident took the life of her mother, but spared her 8 years earlier, she is still trying to get over the grief. Having social anxiety doesn’t help either. An up and coming artist who just landed a commission from the USPS to design a shore birds stamp, Heather’s father has rented Primrose, a beach house on the Isle of Palms, for her to do her painting. What Heather doesn’t realize is that the beach house will serve as more than a temporary home. It will be her saving grace. I loved all of the characters in this story. It was funny and at times sad read but definitely kept me turning the pages. I wished so many times that I was staring out at the ocean while reading this. It’s the kind of book that just brings you back down to earth and makes you stop and appreciate the little things. I took a break from the dark side for a little venture to the Beach House. Even though this is a book in a series by Mary Alice Monroe it can be read as a stand alone. Cara had left her career in the ad market years ago, felt something was missing in her life. She loved her husband desperately she just felt something was lacking in her life. Little did she know her life was going to take another drastic turn. Heather is an introvert with an anxiety disorder due to her father's marriage she is bei I took a break from the dark side for a little venture to the Beach House. Even though this is a book in a series by Mary Alice Monroe it can be read as a stand alone. Heather is an introvert with an anxiety disorder due to her father's marriage she is being relocated so her dad and his new bride can have time alone. Her father rents Cara's Beach House for Heather so she can work on her assignment to paint shoreline birds for her paintings to be turned into stamps. Heather has three canaries that help ease her anxiety and keep her at a level of calm. Bo, hired by Cara's husband, slowly brings Heather out of her shell and encourages her to experience life. As Heather and Bo's love grow, Cara's life is struck by tragedy. As the two women come together, each grows in the path their lives take, their lives are forever changed at the Beach House. Wow! What a deeply emotional book that will surely relate to so many who have suffered loss and need to redefine their lives! A newcomer to the Isle of Palms, Heather Wyatt finds herself outside the boundaries of her comfort zone. Life had not been kind to Heather, and the thought of being on her own for the first time in her life intensified the anxiety that had plagued her since enduring a horrific tragedy. Could she feel safe and at home while living in this beautiful seaside community? Her rental for the summer, Primrose Cottage, was overflowing with history, and that history along with its charm and spirits, would be the catalyst to bringing Heather to a place of comfort, emotional reconciliation and growth. Beach House for Rent was a lovely story about starting over, healing, and of friendship. Set on the Isle of Palms, a serene, magical place with an abundance of local shorebirds and marine life, this lushly written novel had plenty of heart and Southern warmth for readers to savor. I feel sort of dumb because I started this book without realizing it was the fourth in a series. But then, you know what else is sort of dumb? This book. Not garbage, just sort of dumb. Light enjoyable read. It's part of a series so maybe that's why characterization seemed shallow; I think many of the characters had already appeared in series. Setting: the South Carolina island coast and low country, was wonderful. The author is a conservationist; story line includes bird observation & painting and sea turtle rescue. Really liked the descriptions of the shore birds & the sketches that began each chapter. I have been a long time fan of Mary Alice Monroe's books. From Beach House to Skyward to Time Is A River, and then her Lowcountry Summer Series, I have savored her love of the Lowcountry of South Carolina. I have learned about sea turtles and their habits, their amazing journeys to and from the ocean. I have witnessed through her words the survival of sea birds and their habitats, how we all play a part in the conservation of the flora and fauna native to the area and the importance of doing no I have been a long time fan of Mary Alice Monroe's books. From Beach House to Skyward to Time Is A River, and then her Lowcountry Summer Series, I have savored her love of the Lowcountry of South Carolina. I have learned about sea turtles and their habits, their amazing journeys to and from the ocean. I have witnessed through her words the survival of sea birds and their habitats, how we all play a part in the conservation of the flora and fauna native to the area and the importance of doing no harm. Sprinkle in the sand dunes, sea oats, wildflowers and the perfect beach cottage and you have the makings of the perfect beach story- Beach House For Rent. This is the same beach cottage that belonged to Lovie, matriarch of the family. Daughter Cara rents the cottage to a young woman looking for direction and solitude while she begins to paint sea birds, commissioned to be images on postage stamps. Cara and her husband run an eco-tourism boat business. Tragedy strikes Cara's ideal life and the two women are destined to become supporters of each other in surprising ways. Will both women learn how to cope, how to share compassion and empathy, how to move forward and reach their destiny? Monroe has achieved many lists, including the New York Times, USA Today and SIBA and starred reviews. Mary Alice Monroe is the New York Times bestselling author of 22 novels and two children’s picture books. Mary Alice writes richly textured stories that delve into the complexities of interpersonal relationships and the parallels between the land and life. Monroe’s novels are published worldwide.